The presentations listed below are outdated but may provide helpful background on the Vision Project. Representatives of the University of Massachusetts—Marcellette G. Williams, Senior Vice President for Academic and Student Affairs and International Relations, University of Massachusetts' President's Office; Julie Chen, Vice Provost for Research, University of Massachusetts Lowell; and Jim Kurose, University Distinguished Professor of Computer Science, University of Massachusetts Amherst—made a presentation to the Massachusetts Board of Higher Education to preview work and data related to the Research Activity and Economic Activity outcomes of the Vision Project, showcasing the current activities and standings of the University of Massachusetts on various measures within these outcomes. Department of Higher Education staff made a presentation to the Massachusetts Board of Higher Education to preview work and data related to the Workforce Alignment outcome of the Vision Project. David Cedrone, Associate Commissioner for Economic and Workforce Development, explained how the Department and the public higher education system are organizing to meet their objectives under this outcome, and Jonathan Keller, Associate Commissioner for Research, Planning, and Information Systems, presented baseline data related to the outcome. The Commissioner encourages faculty to continue to offer feedback on the Vision Project by emailing commissioner.freeland@bhe.mass.edu. Faculty are also encouraged to subscribe to the Department's email newsletters to get regular updates on the Vision Project and other public higher education initiatives. Department of Higher Education staff made a presentation to the Massachusetts Board of Higher Education to preview work and data related to the College Completion outcome of the Vision Project. Francesca Purcell, Associate Commissioner for Academic and P-16 Policy, explained how the Department and the public higher education system are organizing to meet their objectives under this outcome, and Jonathan Keller, Associate Commissioner for Research, Planning, and Information Systems, presented baseline data related to the outcome. Department of Higher Education staff made a presentation to the Massachusetts Board of Higher Education to preview work and data related to the College Participation outcome of the Vision Project. Aundrea Kelley, Deputy Commissioner for Collaborative and P-16 Initiatives, explained how the Department and the public higher education system are organizing to meet their objectives under this outcome, and Jonathan Keller, Associate Commissioner for Research, Planning, and Information Systems, presented baseline data related to the outcome. among nearly 300 conference attendees. Photo credit: Bob Michelson/Glenn Kulbako Photography. 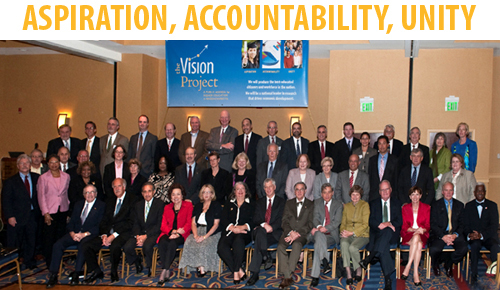 Hundreds of delegates from Massachusetts' 29 public colleges and universities gathered at the Vision Project Academic Conference on September 30 to formally launch the work of the Vision Project. The Board of Higher Education voted to approve and adopt the Vision Project, including the statement of the vision and key outcomes, the proposed metrics, and the issuance of an annual report with comparisons between Massachusetts and other states. Commissioner Freeland, joined by staff project leaders and representatives of the leadership of all Massachusetts public higher education institutions, made a comprehensive presentation to the Board on the year-long development of the Vision Project and its current status.